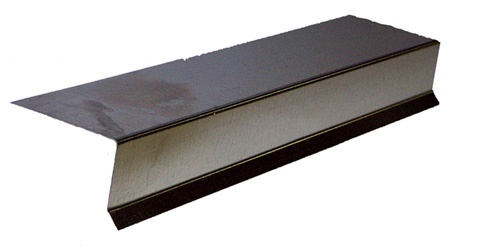 Drip Edge Flashing. If you want to secure the perimeter of your deck, insuring a waterproof seal, you must dial in the metal edges. Prestige Deck Coating knows how crucial properly installed flashing is to guarantee that your patio, balcony, or roof decks are waterproofed. Exterior Perimeter. For open decks with no drainage system or enclosing walls, a special kind of flashing is used. 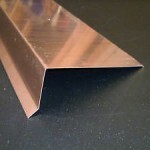 In order to allow for water to sheet or flow off the deck, drip edge flashing is employed (see picture to right). 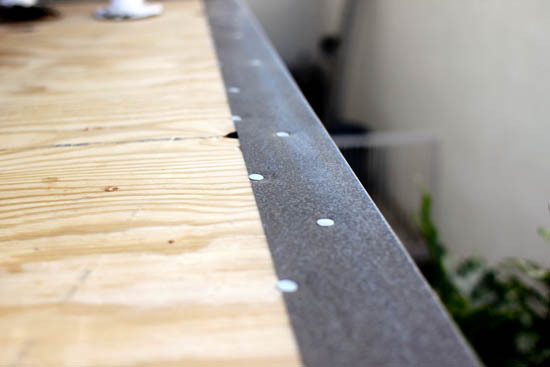 There is a tiny lip on the flashing facing out to encourage the sheeting water to stay away from the wood facing of the decks. Quality Products. At Prestige Deck Coating, we use 24 gauge bonderized metal drip edge flashing to insure strength and proper flex for your Orange County deck waterproofing foundations. The flashing is fitted tightly against the corners of the deck, then we generously apply industry grade caulking. We leave no corner uncaulked! 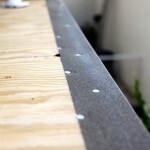 Proper flashing installation is key to avoiding future decking leaks. 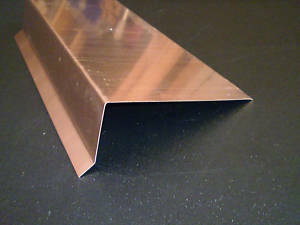 Any holes in the metal are eliminated, and a snug fit into the corners is achieved. We at Prestige, secure the perimeter! Next, we adhere the drip edge flashing to the deck subfloor. This is done in two ways. Caulking in applied behind the metal. Second, the flashing is secured to the subfloor with industry grade nails, one per six inches. Each overlap on the metalwork and possible hole is sealed with caulking to insure waterproofing. Prestige Deck Coating leaves no hole unplugged, no corner exposed. This sets the stage for the metal lathe level. 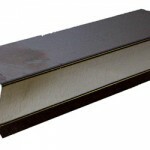 Waterproof Deck Coatings begin with proper drip edge flashing metal installation.